...that following his disappearance in the Battle of Saturn, Prince Uldren Sov allowed himself to be captured by the Fallen House of Kings to meet their kell? ...that the Awoken sacrificed their fleet and their queen to halt the advance of Oryx's Dreadnaught and the Hive fleet? ...that only one Fate of All Fools existed during Year One of Destiny, but The Taken King finally made it obtainable for all players in the form of The Jade Rabbit? ...that Bungie approved of the nickname "Kinderguardians" for people new to the game? "I don't have time to explain why I don't have time to explain." This article has new content coming soon from Destiny 2 and may not be complete, confirmed, or correct. Please update it as soon as any relevant and accurate material is available. Editors must cite sources for all contributions to this article. Edits that do not follow this standard will be reverted without notice. For more information, see the Citation Policy. Shock Pistols are used by Dregs of all stripes, including but not limited to, Enhanced Dregs, Perfected Dregs, Splicer Dregs, and Wolf Scavengers. These weapons are either paired with a Shock Dagger, used alone or dual-wielded. 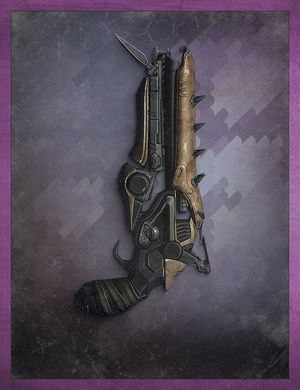 Guardians can use a wieldable version of the Shock Pistol, called the Dreg's Promise. The Shock Pistol is a simple but deadly weapon, and a mainstay of the Fallen arsenal. Primarily utilized by the lower ranking members of a given Fallen crew, Shock Pistols discharge bolts of Arc energy. The Dreg's Promise, a usable version of the Shock Pistol.